Fox4 finally has followed through on what it planned to do in the first place -- hire a co-host for its late night Free 4 All program. 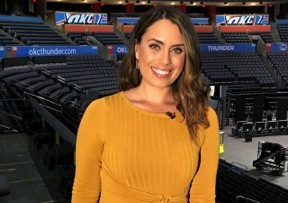 The station announced Thursday that Samantha “Sam” Gannon will be joining incumbent Mike Doocy in mid-March while also reporting and producing for the half-hour program, which airs weeknights at 10:30 p.m.
Gannon arrives from Oklahoma City’s KOKH-TV, where she’s been a weekend sports anchor and producer for the past six years. The University of Connecticut graduate previously has worked at KPLC-TV in Lake Charles, Louisiana and with NBC Connecticut. “As someone who understands passionate fan bases, it is an honor to have the opportunity to work here in one of the best sports markets in the country,” Gannon said in a publicity release. Doocy, who also is Fox4’s main sports anchor, has been soloing on Free 4 All since its premiere last September. Relying on a steady diet of personalities from KTCK-AM (1310 “The Ticket”), the program has held its own in the D-FW Nielsen ratings. In the just concluded February “sweeps,” Free 4 All ran a close fourth in total viewers behind the first half hours of the Stephen Colbert, Jimmy Fallon and Jimmy Kimmel network talk shows. It fared better among advertiser-coveted 18-to-49-year-olds, running second to Kimmel, and won from 10:30 to 11 p.m. among 25-to-54-year-olds (the main advertiser target audience for news programming).